In February, the MESD distributed a stakeholder engagement survey to the directors and superintendents in our eight component districts. We asked for feedback on eight key metrics; quality, customer service, responsiveness, value for money, consistency, overall satisfaction, effectiveness, and importance. We also asked questions about how our districts wanted to be engaged and the efficacy of our advisory groups. The results are in and we’re pleased to share that results are good overall with room for us to improve how we support districts. Last August the agency adopted a new mission, vision, set of values and strategic plan with five goals. Goal 3 is “Increase district and community participation and satisfaction in MESD services.” As a starting point, the MESD needs to establish the level of satisfaction that the leadership our component districts have with MESD services. Goal 3 Team worked diligently to prepare a survey to allow MESD to measure satisfaction. Thank you Goal 3 Team! MESD Directors have reviewed the survey results and are following up with districts in response to the feedback. Directors will be making plans with our district partners to facilitate improvements in services. Plans will be shared with the agency in late May. The survey and our response to the survey results are part of the culture of continuous improvement being created at MESD. Beginning in 2018, the MESD began taking steps to accomplish Strategic Plan Goal 3 to “increase district and community satisfaction and participation with MESD services.” Our first action was to offer a stakeholder engagement survey to directors and superintendents in our component districts to measure satisfaction with MESD services. While it is important to focus on critical day to day work of serving districts and students, it is also important that we as an agency take a step back identify areas where the agency is excelling and areas where we could make gradual improvements in our systems to provide better services. This practice is commonly referred to as a culture of continuous improvement. Creating a culture of reflection and continuous improvement at MESD is especially important. One of the roles of MESD in the community is to provide support, training, and expertise to help districts improve outcomes for students. To ensure that we are able to provide this, it is crucial that we are a model. Asking for, and responding to, feedback will be part of our culture both internally and externally. Respondents were surveyed about programs at the MESD across 5 categories. 28 respondents answered questions across 8 metrics. 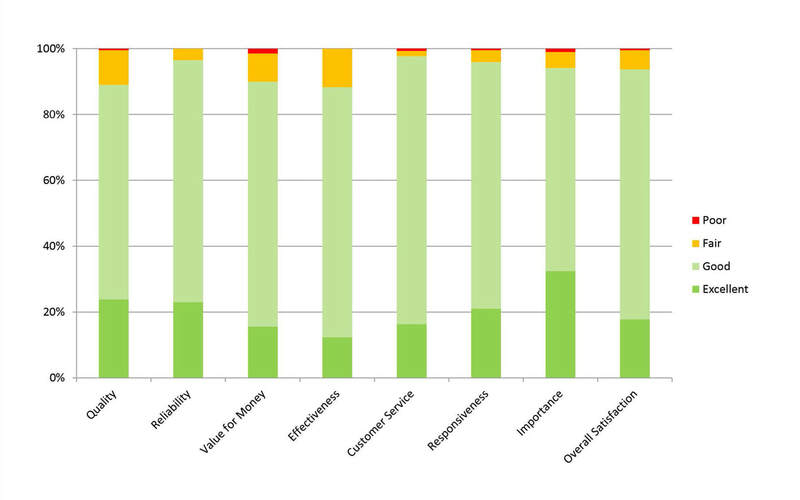 Over 80% of responses rated as Good or Excellent for all 8 metrics.